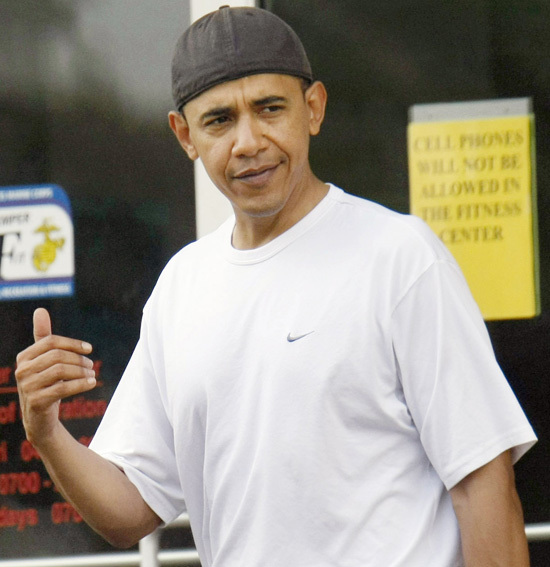 It hasn’t exactly been all fruit cups and Cool Whip for our President in recent times. In the name of rescuing America from it’s Bushtopian past, Barack Obama has managed to pass some exorbitant spending bills through Congress – which you will recall were earmark-free (except for all the earmarks). But other than saving billions and billions of jobs through his Spendulous Bill, nothing else really seems to be falling into place for him. Whereas at one time, he sent shivers up the legs of the adoring masses, he now seems to be sending shivers down the spines of concerned, liberty-loving Americans. His “What The Hell Happened?” check list is ever-growing. Despite Democrat control of both houses of Congress, he’s just not getting the needed love regarding two of his biggest domestic initiatives: government-run health care and anti-global warming legislation. Despite assurances that the era of Bush is dead, he’s failing to command too much respect from America’s adversaries either, although the President seems determined to perfect the art of perpetual negotiation until such a time that Iranian nuclear bombs can do all the talking. Of course, Tuesday’s Election Day results – which according to Democrats meant nothing except for Bill Owens victory in the New York-23 race – weren’t exactly a big wet kiss on the lips of liberalism either. But can there be anything more disheartening, more dejecting, than having a long time bed fellow stab you in the back? Can there be anything so painful as having an old buddy take a machete to your jugular? NBC Chicago, not exactly a bastion of conservative discourse, posted an article by Robert A. George in which he ripped the President for the way he handled himself yesterday in front of the nation after the Fort Hood massacre. But instead of a somber chief executive offering reassuring words and expressions of sympathy and compassion, viewers saw a wildly disconnected and inappropriately light president making introductory remarks. At the event, a Tribal Nations Conference hosted by the Department of Interior’s Bureau of Indian affairs, the president thanked various staffers and offered a “shout-out” to “Dr. Joe Medicine Crow — that Congressional Medal of Honor winner.” Three minutes in, the president spoke about the shooting, in measured and appropriate terms. Dr. Joe Medicine Crow, incidentally, did not win the Congressional Medal of Honor. Even his teleprompters are turning against him. If the president’s communications apparatus can’t inform — and protect — their boss during tense moments when the country needs to see a focused commander-in-chief and a compassionate head of state, it has disastrous consequences for that president’s party and supporters. Bloggers are calling it Obama’s “My Pet Goat” moment – a reference to George W. Bush and they way he reacted (or didn’t react) on the morning of September 11, 2001 after hearing news of the terrorist attacks in New York. (Keep in mind that from the time the second plane hit the South Tower of the World Trace Center to the time he addressed the nation, only 26 minutes had passed. The Pentagon hadn’t even been hit yet). (Obama’s) too calm under pressure. It’s inappropriate. Why not flip out more, cry, wail, and beat himself out of sympathy? Liberals are cute when they think they’ve seized upon a brilliant point. It would have been appropriate – and presidential – to have the Commander-in-Chief of the United States Armed Forces step up to the podium, with the entire nation watching, and act like the matter of thirteen dead Americans held a little more relevance than offering “shout-outs” to a Congressional Medal of Honor winner (who, by the way, didn’t even win that medal). It would have been the right thing to do to forego the three minutes of self-absorbed “I-love-to-hear-my-own-voice” ishkabibble and immediately acknowledge the deaths of American service people at the hand of a cold-blooded killer on American soil. It would have made sense to see the President of the United States put some of that fabled articulacy and poise to work when it was needed most. However, this is Barack Obama – a disengaged, detached messiah who is still having a difficult time understanding why his mere presence doesn’t ease the pain. The amount of time President Bush spent in that classroom after Andy Carr leaned over and told him about the second plane was actually five minutes, not seven, as is regularly peddled by the left. (It’s hard to give the anti-Bushees too much credence when simple, easy-to-verify facts like this are missed). President Bush’s Press Secretary Ari Fleischer was standing in the back of the classroom holding up a pad of paper on which he had written “Don’t say anything yet.” A look at the video tape from that morning shows the President acknowledging Fleischer. One can also see from watching the uncut video tape that once he knew about the second plane, the President’s focus had all but shifted from the school children to the situation at hand. 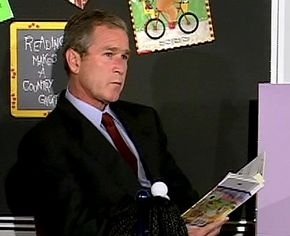 (Incidentally, the children were reading to him, not the other way around – another little detail that is regularly missed by the anti-Bush brigades). He became contemplative, clearly collecting his thoughts. Above all, he did not panic. He did not leap out of his chair. He did not react hastily. He was out the door in just a few minutes and addressing the nation within twenty minutes. He behaved in a most Presidential manner. No one thought any different at the time. I was very pleased with the way it was handled – that he took a few moments to gather himself. It wasn’t this gigantic amount of time … I didn’t vote for him, but on that day, at that moment in time, I very easily could have. That was the first time I could think of, in his short tenure in office, where he looked Presidential to me. He made a good decision to stop and think and respond rather than react to the terrorism. If terrorism is supposed to strike terror in the hearts of men, you didn’t see it on him at that point in time. The title only became relevant when liberals began reconstructing history – and they couldn’t even get that right.